Selling a Tonka? 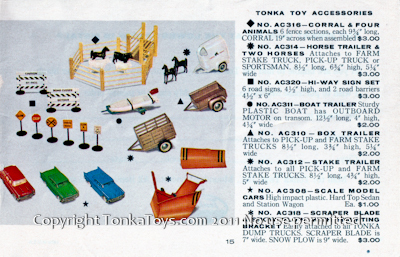 Tonka 1959 Look Book Details - all Items for 1959 shown. Please be patient, lots of photos to load. 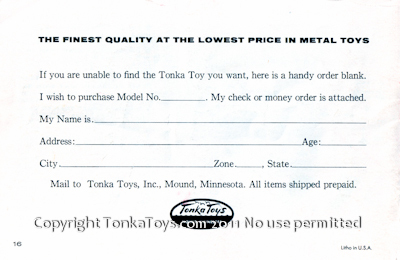 Interested in Selling Tonka Toys? click here. 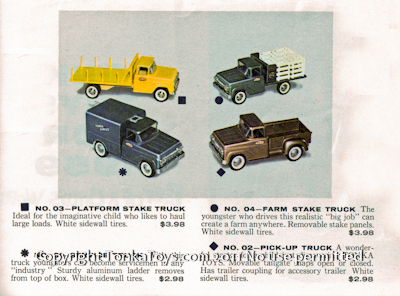 Tonka Toys Look Book from 1959 - 1959 was a terrific year for Tonka Toys and the second year for the new design in trucks which have a "square front" a huge change from the round fender design which ran through 1957. 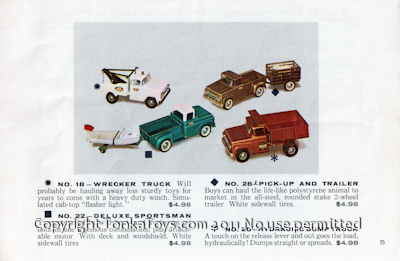 Tonka included 43 catalogs items which included individual trucks, sets and accessories. 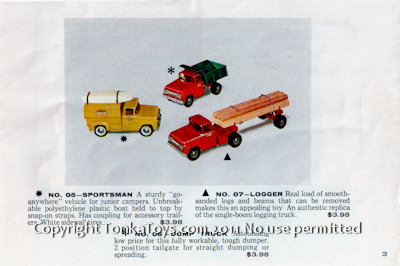 1959 was a terrific year for Tonka toys. This year's models were as colorful and diverse is any year produced. 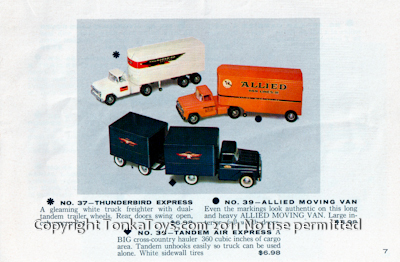 A few of the models produced in 1959 that are hard to find and I am especially looking for are the yellow number three platform state truck. the no. 16 Air Express truck, no. 30 tandem platform stake truck, No. Tandem air express, no. 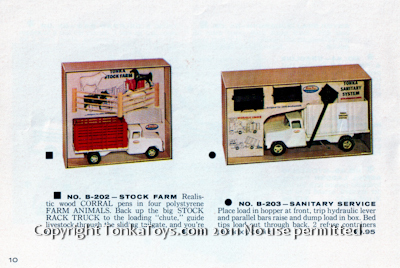 203 sanitary service set and the Tonka B-202 stock farm set. 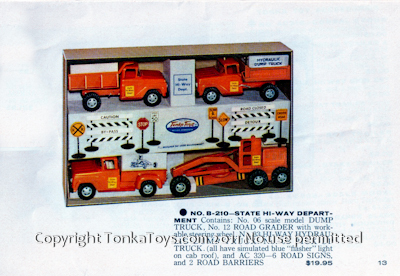 Tonka Toy Accessories produced in 1959 are also on my list this includes Tonka AC 316, Tonka AC 314, Tonka AC 320, Tonka AC 311, Tonka AC 310,Tonka AC 312, Tonka AC 308 Scale Model Cars and Tonka AC 318 scraper blade and snowplow with mounting bracket. Because these items were separate sale accessories they were made and sold and fewer quantities making them harder to find today. Ideal for the imaginative child who likes to haul large loads. White sidewall tires. The youngster who drives this realistic big job can creative form anywhere. Removable state panels. White sidewall tires. A Wonderful Starter for Child Just Discovering Tonka Toys. Movable tailgate snaps open or closed. Has trailer coupling for accessory trailer. White sidewall tires. With this truck youngsters can become servicemen in any industry. Sturdy aluminum ladder removes from top of box. White sidewall tires. Real load of smooth sanded logs and beams that can be removed make this an appealing toy. An authentic replica of the single boom logging truck. Astounding low price for this fully workable, tough dumper. To position tailgate for stray dumping or spreading. Actually scoops dirt like it's real life big brother. Moves four ways. Backwards and forwards swivels on base scoops raises. Blade that tilts and rotates, all weather, real steering wheel the terms of front wheels, floating dual back wheels. Exact replica of standard express truck used it air terminals. Rear door swing open so packages can be easily removed. White sidewall tires. 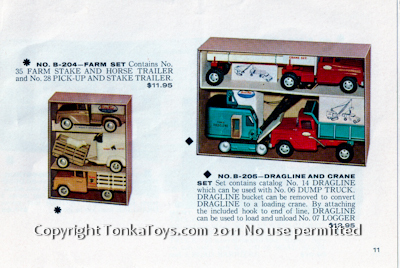 will probably be hauling away less dirty toys for years to come with heavy duty which. Simulated Top flasher light. 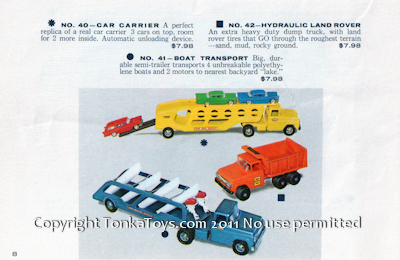 youngsters thrilled with boats and trucks can get both in one ingenious combination, plus attachable motor. With deck and windshield. White sidewall tires. boys get all the lifelike polystyrene animal to market in the all steel, rounded stake two wheel trailer. White sidewall tires. heavy-duty horse trailer carries two spirited polystyrene steeds. The farm state truck, has removable round edge state panels for taking on odd shaped loads. White sidewall tires on truck and trailer. a big and impressive model of the real thing. Has real sliding tailgate. Animals and other accessories are available. 95 square inch of hauling capacity. Heavy steel trailer uncouple so truck can be used separately. All wheels on trailer are dual. White sidewall tires on truck and trailer. big hydraulic dump truck we steel braised dump box with drop-down sides into position tailgate. Signs included. a gleaming white freighter with dual tandem trailer wheels. Rear doors swing open, On couples. a perfect replica of a real car carrier three cars on top, room for two more inside. Automatic unloading device. an extra heavy-duty dump truck, with Land Rover tires they go through the toughest terrain. Sand, mud, rocky ground. Note: this is a tough truck to find and I am interested in buying any number 42 hydraulic Land Rover. big durable semi trailer transports for unbreakable polyethylene boats and two motors to nearest backyard lake. dragline that moves for ways is secured to trailer with chain on winch. Dragline on couples from trailer. Both heavy and durable. it actually looks up to its own miniature hydrant which is included. Connects to in any standard garden hose. Fire hose winds up on reel. 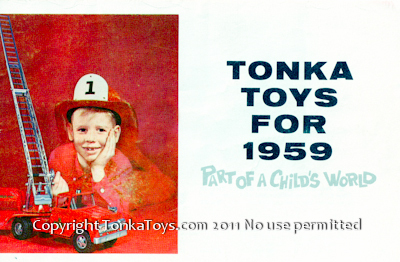 Note: 1959 is the only year Tonka produced white colored fire trucks. 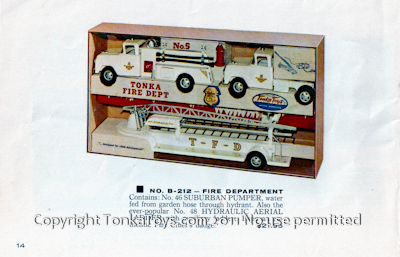 These came in either the 1959 Tonka B-212 fire Department set, or the single sale number 46 Suburban Pumper. realistic wood corral pens in for polystyrene farm animals. Back up the big stock rack truck to the loading chute guide livestock through the slide. place loading hopper at front, trip hydraulic lever and parallel bars raised the dump load inbox. Bed tips loadout through back. To refuse containers included. contains no. 35 farm steak and horse trailer and no. 28 pick-up and stake trailer. contains no. 06 sportsman, no. 02 pick-up truck, for trailers: AC 314 horse trailer AC 310 box trailer AC 312 stake trailer and AC 3110 trailer with boat and motor. contains no. 06 scale model dump truck, no. 12 road grader with adjustable blade; no. 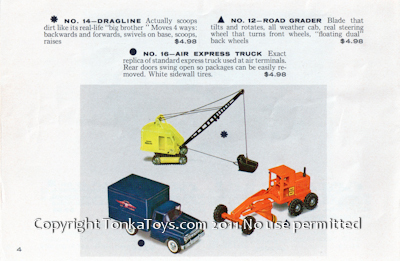 44 dragline that moves for ways; equipment trailer that moves dragline from job to job. contains no. 06 scale model dump truck, no. 12 road grader with workable steering wheel, no. 33 hi-way hydraulic dump truck, no. 02 pick-up truck. All have simulated blue flasher light on Roof. And AC 320-6 6 road signs, and two road barriers. contains: no. 46 Suburban Pumper, water fed from garden hose through hydrant. Also the ever popular no. 48 Hydraulic Aerial Ladder Truck with auxiliary ladders. Even and authentic fire chiefs that. Note: this is the only year the white fire trucks were produced. six fence sections, each night in three-quarter inches long, corral 19 inches across when assembled. attaches to farm state truck, pickup truck or sportsman. 8 1/2 inches long, six in three-quarter inches high, 5 1/4 inches wide. six road signs, 40 half inches high, and two road barriers 4 1/2 by 6 inches high. sturdy plastic boat has outboard motor on transom. 12 1/2 inches long, or4nches high, 4 1/4 inches wide. attaches to pick up and farm state truck's. attaches to all pickup and farm stake trucks. high impact plastic. Hardtop sedan and station wagon. easily attached to all Tonka dump truck's. Scraper blade is 7 inches wide. Snowplow is 9 inches wide. 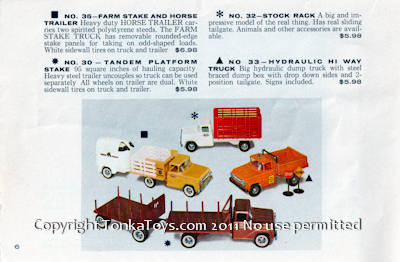 Wanted Tonka Trucks : I am currently looking for the following tonkas in the configurations noted these private label Tonka's are harder to come by as they were not included in catalog sets, if you have toys like this please let me know I would love to have the opportunity to buy them from you and add them to my website. 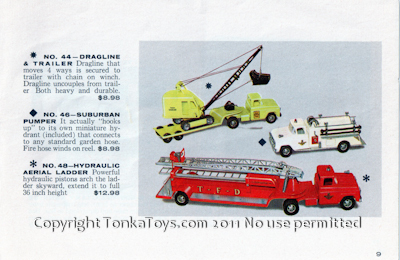 Tonka Younkers Private Label Semi - Let me know if you come across this one! 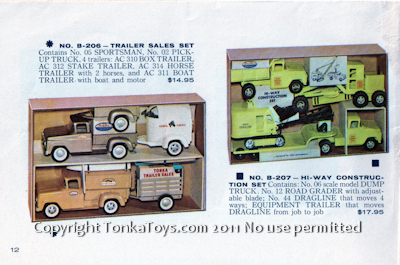 I would like to buy a good example of any of these Tonka Private Label Trucks but the Younkers is high on my list! This website is owned by Micah James Copyright 2008-2011. All Rights Reserved. The design and images other than the TonkaToys Logo are the property of Micah James. If you would like to use any of the photos of graphics on my site, please email me.